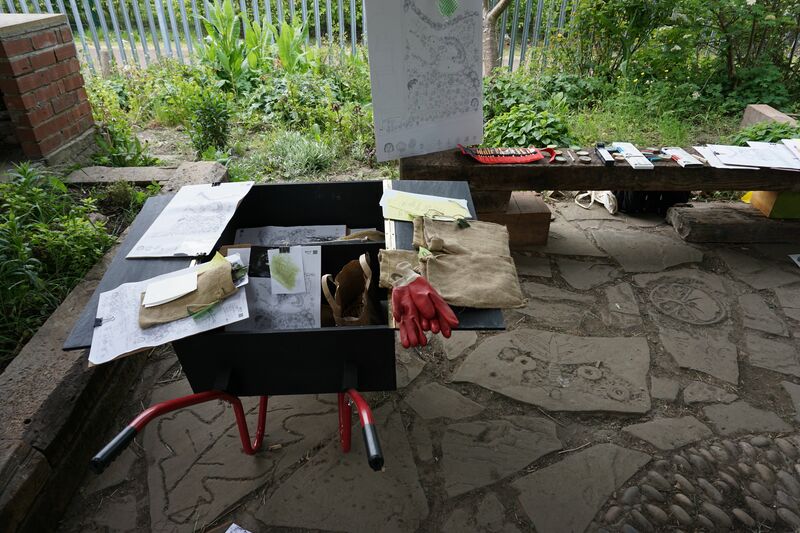 Here Daniel Mallo, Abigail Schoneboom and Armelle Tardiveau tell us about the ongoing work on their recent ESRC IAA funded project based in Scotswood Natural Community Garden. Scotswood Natural Community Garden (SNCG), an independent charity, is located in Newcastle upon Tyne in a neighbourhood ranked in the highest 10% for income, health, employment, education and training deprivation in the UK. SNCG is the only natural green space in the area and one of very few organisations in the North East offering nature-based interventions for disadvantaged people. Established in 1995 and designed by the local community, the 2.5-acre garden includes wildflower meadows, forests, woodland, ponds and fruit and vegetable gardens. Last year over 5000 people participated in the garden’s activities or visited the garden. This ESRC IAA funded project aims to engage garden users and stakeholders (volunteers, youth groups, staff, trustees, school staff and local people) in a participatory design and research process that explores the value of SCNG to its key users, working towards a shared vision for the future of the garden, developing a vision for a new facility that will expand the SCNG’s highly valued programme. The project team comprises architects Armelle Tardiveau and Daniel Mallo, sociologist/ethnographer Abigail Schoneboom, and research assistant Sophie Baldwin. During May and June this year, SCNG’s volunteers, youth group members, staff and trustees have been busy exploring the meanings and value that attach to this wonderful community garden, nestled in one of Newcastle Upon Tyne’s most deprived neighbourhoods. 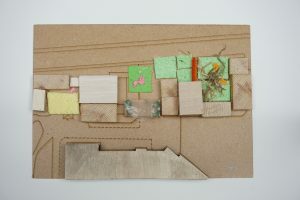 With the goal of envisioning a new structure that will better serve users of this popular community resource, participants have explored the garden through sensory research and model-making, creating a richly textured portrait and a set of creative ideas that will inform the future development of the space. In phase one, we worked with an inviting map created by research assistant Sophie, which highlights the garden’s spatial richness created by a diverse biodiversity and enchanting layout. 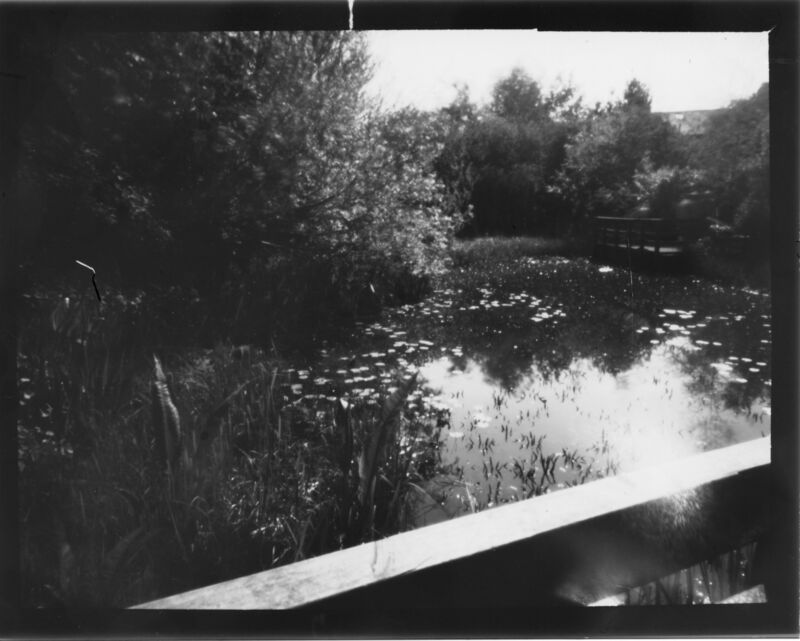 Having marked our favourite spots on the map, we captured through pinhole camera photographs these special places in the garden. Pinhole photography requires a very simple camera but taking a single photo can take up to half an hour of exposure! For us, this was a wonderful way to immerse ourselves in the garden and spend quality time smelling, listening to, touching and noting down on a map our feelings about these treasured locations. Alongside the photos and notes, we collected objects (such as dandelion leaves, pieces of string from the den-building area, and a blue-green fragment of a bird’s egg) and made sketches and rubbings. Together, these create a rich interpretation of what the garden means to its users. Using the tool shed as a darkroom, we ended each workshop by developing the photos and watching the images reveal themselves. The silvery, poetic photos created in these first workshops capture something magical about the garden, encouraging us to dream and imagine possibilities. This photograph was taken by a garden volunteer. 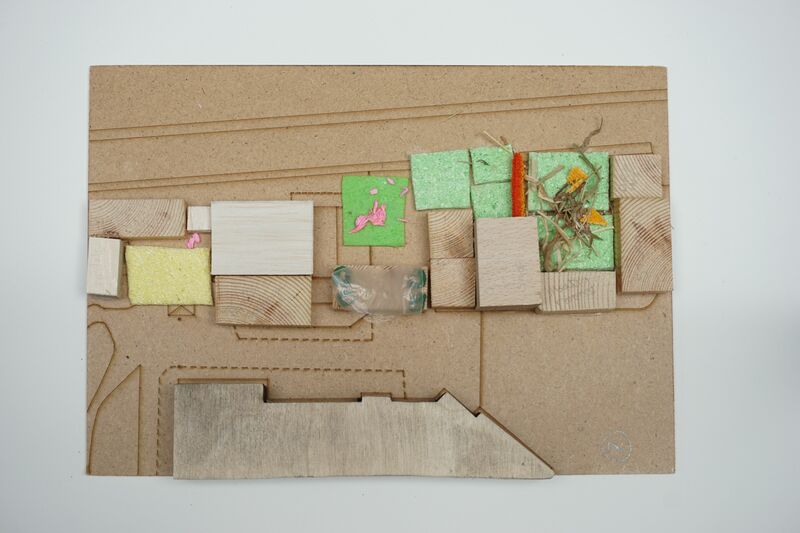 In phase two, we built models and framed aspects of the garden, thinking about ways to envisage a new facility with some of the values and sensory qualities we had highlighted in phase one. Working with scaled wooden blocks and a range of materials from felt to scouring pads to evoke atmosphere, we created models that explored possibilities such as opening the indoors into the outdoors or using the vertical space to create a viewing platform. During the modeling activity, we also worked in pairs to ‘frame’ and photograph aspects of the garden that might inform views from the new structure. We imagined being indoor and looking onto the reflective qualities of water or witnessing edibles growing and changing. We had a lot of fun (and a few challenges) carrying the heavy wood and hessian frame through the winding, narrow paths of the garden. The garden is home to many great stories and memories, and much healing – the hum of the traffic on the nearby road, overlaid by birdsong and the rustling of the wind in the trees, is a welcome reminder of just how precious this place is. Themes that have emerged from our work together so far include the importance of building or growing something yourself, feeling protected and secure but out in the fresh air, and being connected to other people and the rhythms of nature. Also space overlaps and conflicts between the many groups of users enjoying the facility became apparent with its related ad-hoc but inventive approach to storage catering for all. We have already displayed some of or initial findings and photos at SNCG. Our next step, over the coming weeks, is to materialise and enact some of the ideas with the input of the volunteers. These might be in the form of furniture or spatial adaptations that we will invite visitors to inhabit. This temporary and playful engagement, we hope, will move us further towards a design proposal for a new facility that grows out of the vibrant imaginations and experience of those who use it most and know it best.